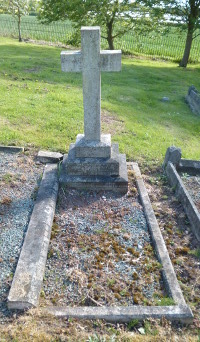 Memorial to John Taylor on his brother's gravestone at Lapley. John Taylor was born at Wheaton Aston in about 1899. He was the son of John Taylor, a hay trusser, and his wife Emma. The family lived in Long Street. John was probably called up towards the end of 1917 (he had served for no more than a year at the time of his death). He joined the 2nd Battalion of the Lincolnshire Regiment. He was killed in action on 23rd October, 1918, when the Battalion was involved in fighting near Ovillers. The Battalion's advance was halted by heavy machine gun fire and shelling. 28 Other Ranks were killed and 132 wounded. John is buried in Montay-Neuvilly Road Cemetery, Montay. Private John Taylor, 61554, was awarded the Victory and British War Medals.